The Swartdogs left for China early on Monday, August 10, 2015. We flew 14 hours from Chicago to Seoul and the trip wasn’t over yet. 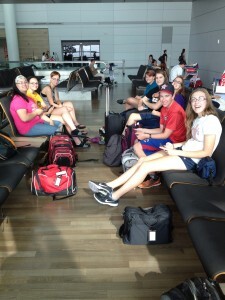 We had a few hour layover in Seoul before our final 3 hour flight from there to Hong Kong. 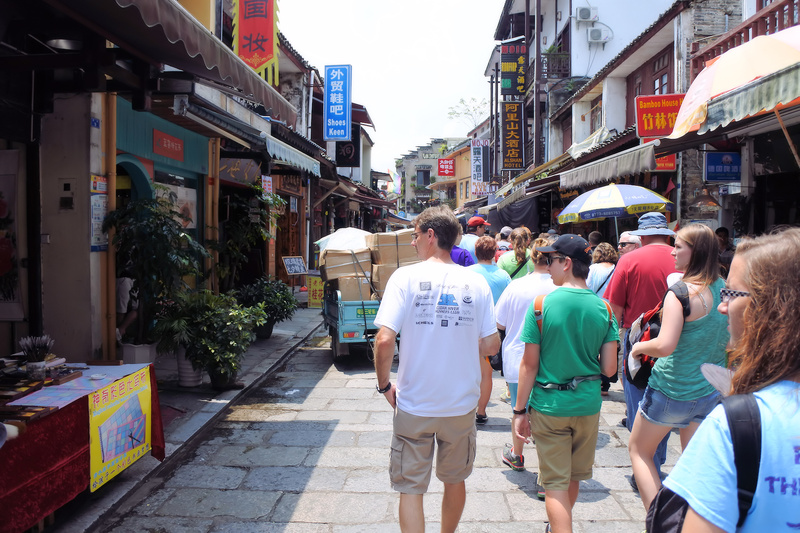 But, because we weren’t actually staying in Hong Kong, we still had to take vans to our hotel in Shenzhen. This meant going through more customs and another couple hours of driving. Due to the amount of travel and the time change, we didn’t get to our hotel until 2 a.m on Wednesday, August 13. 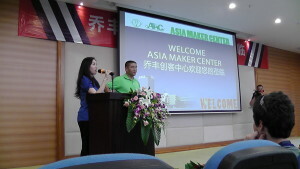 On Wednesday we headed to the Asia Makers Center with the other international teams to start helping the Chinese teams there. We were given a brief tour of the Makers Center when first arriving at the building. It was really interesting to walk through the it and look at all of the different machines and products that were being made as well as where we would be working for the next 2 days. 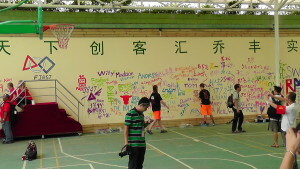 After the tour all of the teams got to sign a couple walls right outside the building with their names, and team names and numbers. Charlotte also drew the FIRST logo on one of the walls. There was also a quick presentation, during which the owner of the building talked about what his company was all about. When he was finished talking we found out the teams we would be working with and what they had already been working on. When it was time for us to head out for the night we were all exhausted, but excited with the work that the teams accomplished. 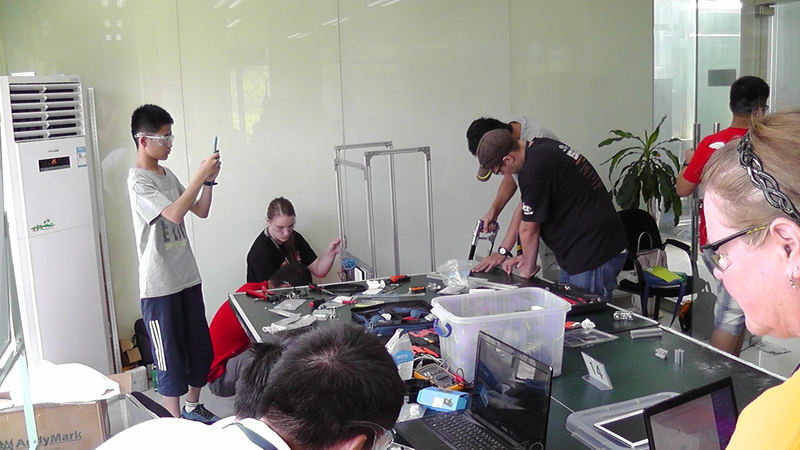 On Thursday we spent about half a day back at the Asia Maker Center helping the Chinese teams. When we left the Maker Center we headed towards the train station. We took a bullet train that went 180 mph to Guilin (about a 4 hour ride from Shenzhen) where we planned to do some sightseeing. 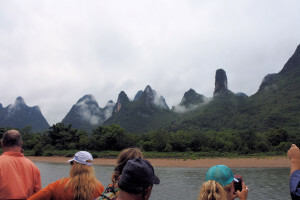 Once we got to Guilin we went out for dinner before heading to our hotel for the night. We knew Friday was going to be one of our busiest days and it started day off with a “river cruise”. It was very neat to see all of the different shaped mountains and landscapes. Everything was very different from the flat Iowa landscapes! For lunch there was buffet, but our mentors also ordered additional fresh seafood as an option for people to try. Some of the team decided to be adventurous and try one of the more interesting choices: snails. When the river cruise ended we were in YougShou, a nearby city to Guilin. We then walked to the Butterfly Cave. 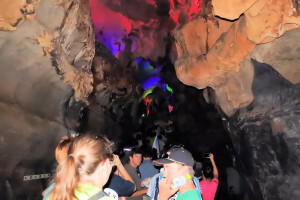 The cave was packed full of people, but it was also really pretty. When we finished going through the cave we went to find dinner on West Street. We eventually settled on a place that served many American options. We were all ready for some American food after going mostly without it for the last 4 days! We also ended up shopping on West Street for a few hours. It was a very different shopping experience than what we are used to in the United States because we were expected to barter with the locals to get the price down. We ended the day with a late night show on the river that was directed by the same person who directed the opening ceremonies of the Olympics when it was held in Beijing. We started Saturday off with a raft ride on the river. It was really fun and some of our team even got a chance to steer the raft with only a stick. After the ride and after lunch we rounded out our day with a walk through another really pretty cave. This cave was a large cave than the Butterfly cave. We then took the bullet train back to Shenzhen for the competition. 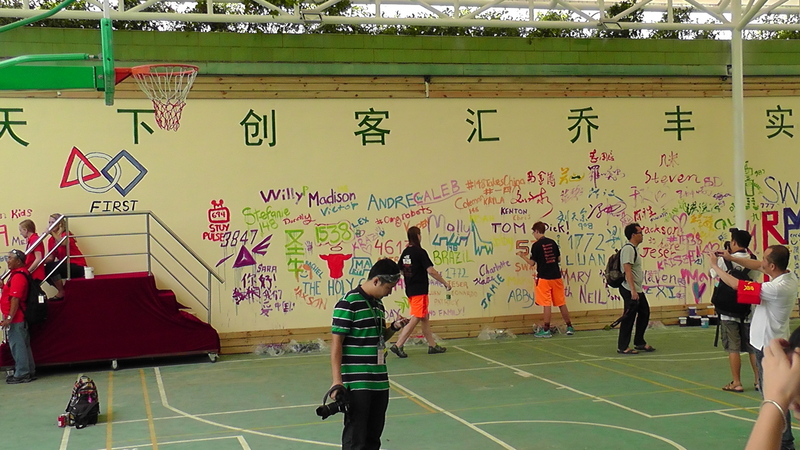 On Sunday we went to a high school where the Chinese teams had moved their work site to. Even though we had just seen their robots a couple days earlier some of the teams had made major changes to them and it was neat to see their ideas change as they realized what would and wouldn’t work. 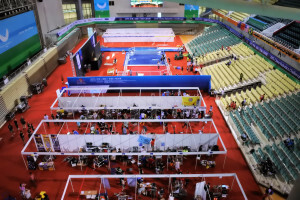 When it was time for us to go we headed to the University of Shenzhen, the venue for the competition. The Chinese teams didn’t join us once we got there so this was our time to uncrate the robot. There was also a lot of preparation required to get the field set up. 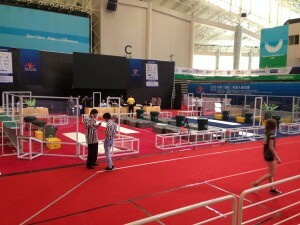 Monday morning was filled with final robot work and adjustments and practice matches started in the afternoon. 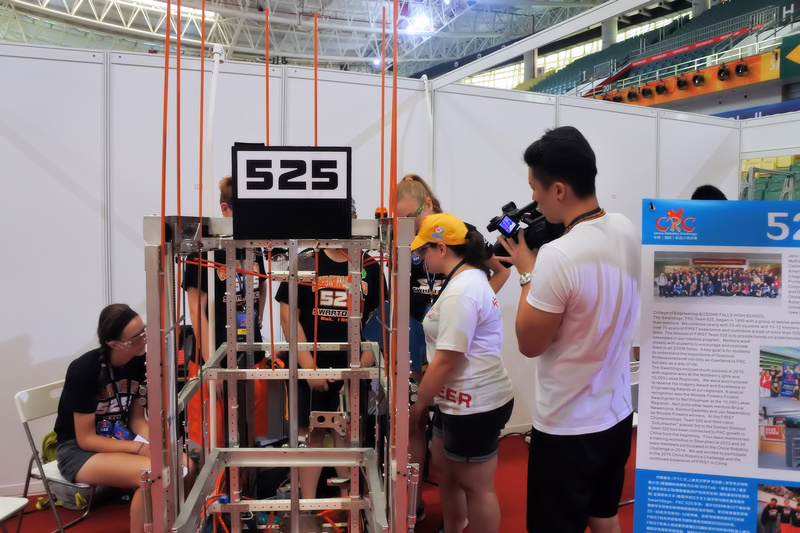 The practice matches allowed all teams to get used to the different field quirks and changes, and our new drive teams get used to working with each other in a live match setting. Everyone was excited for the Qualification matches to start on Tuesday. Each team got 8 matches. Playoff matches then started on Wednesday. There were 2 sets of playoff matches: the first with all teams participating and one with only Chinese teams. There were also safety and other judged awards presented. 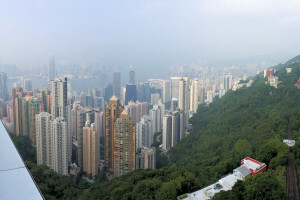 On Thursday, our last day in China, we got to do some sightseeing in Hong Kong. We stopped at a local mall for lunch before heading to Victoria Peak. We took a tram up the peak. At the top there were a lot of shops where some people purchased more souvenirs. We were also able to go on the roof and look out over the harbor and the city. It was a beautiful view and it looked completely different at night when all the lights were on in the buildings.